A bank, for example, might use a borrower’s credit score to determine what interest rates to charge. The lower the score, the greater the risk of not being paid back. As such, that lender would likely charge a higher interest rate. Many landlords use credit scores when interviewing apartment candidates. Those with lower scores may have to pay larger deposits or higher rent to qualify for a new lease. This is why monitoring your credit score is important. Fortunately, getting a hold of your credit report is incredibly easy — especially if you go through one of the three-biggest credit bureaus: Equifax, TransUnion, and Experian. Under U.S. consumer law, every American is allowed one free credit report per year — from each of the three major bureaus. This means you don’t have to choose one reporting agency over another. In fact, you shouldn’t rely on any single report since your score will likely differ among the three bureaus. Each credit reporting agency collects information in slightly different ways, meaning that scores can vary somewhat — even if it’s the same person. Lenders, creditors, and businesses send information to these reporting agencies at different times. It’s possible that Equifax could be working from a more recent snapshot of your financial history than TransUnion. 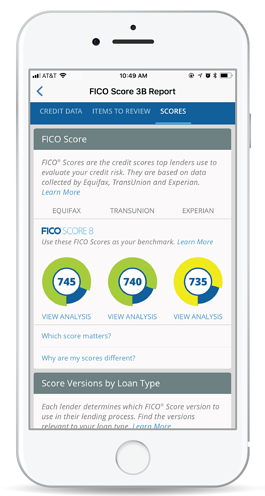 All three of the major credit bureaus use their own internal algorithms when determining a person’s score. Even if the starting information is identical, the final result may differ. It could be that the credit reporting agencies are tracking the same person — under different names. This sometimes happens with marriages or adoptions. Still, mistakes like this are quite rare since Social Security numbers are unique. Because of these potential differences, it is vital that you do request credit reports from all three agencies. Mistakes or blemishes could go undetected for years if you only have access to a single report. This is particularly true if you’re one of the 16.7 million Americans who fall victim to identity theft every year. Requesting free reports from all three of the major credit bureaus provides you with the most complete snapshot of your financial history. If there are mistakes or blemishes on your report, it is critical that you work to correct them as soon as possible. Otherwise, you’ll have to pay unnecessarily high interest rates when borrowing money — assuming banks lend to you at all. The moment you spot anything out of the ordinary, call that lender, creditor or merchant immediately to figure out what the problem is. Be sure to keep your bank or credit card issuer in the loop, as well. Some mistakes can be fixed with a few simple phone calls. Others might take weeks or months to resolve. That’s assuming you’re trying to “fix” mistakes. For more tips on improving your credit score, protecting your identity, and being smart with payments, click below to read and subscribe to our blog.